To further our understanding of the distribution and geometry of Quaternary deposits in the study area, a 3D geological model of the Quaternary geology was constructed using GSI3D © software (Kessler, et al, 2009). This involved correlating the geological units through strings of borehole logs in 2D cross-sections and using the correlated sections and geological map data to inform the 2D distribution of each geological unit on the model. The model building process is described in more detail in Burke et al (2016). The northern half of the study area is covered by 1:50 000 scale geological map sheet 97 (Runcorn), which was last surveyed in 1930–38 at six inch (1:10 560) scale, with minor amendments made in 1977. The south of the study area is covered by 1:50 000 scale geological map sheet 109 (Chester). The southern half of the model area is also covered by 1:10 000 scale map sheets SJ47SW and SJ47SE, which were surveyed in 1935–58, with minor amendments made in 1986. These geological map sheet areas are shown in Figure 3. Figure 3 1:50 000 and 1:10 000 scale geological map coverage of the study area (outlined in red). 1 km grid squares shown. Includes Ordnance Survey data © Crown copyright and database rights  Ordnance Survey [100021290 EUL]. The model broadly matches the corresponding 1:10 000 scale digital geological map data of the area (Figure 4). This shows a large expanse of Tidal Flat Deposits in the north of the study area associated with the southern edge of the Mersey estuary. The mapped extent of Tidal Flat Deposits does not extend into the Mersey channel, but they are modelled to the northern margin of the model area. An arbitrary line separating the Tidal Flat Deposits from Alluvium associated with the River Gowy, with which they are transitional, is replicated in the model. Peat is mapped in the south of the model in the floodplain of the the River Gowy. An extensive covering of Devensian till is mapped either side of the River Gowy floodplain alluvium and peat. Several small patches of glacial sand and gravel are mapped at the edges of the till. Bedrock is mapped at surface in areas where superficial deposits are absent. No bedrock geological faults are modelled. No artificial ground is mapped in the DiGMapGB dataset within the project area. However, Made Ground is modelled where it forms obvious features in the Digital Terrain Model (DTM) representing the ground surface and where indicated in boreholes. The Manchester Ship Canal is modelled as Worked Ground. The bedrock geology is being modelled separately and is therefore not represented in this model. However, Sherwood Sandstone Group is modelled where weathered to sand. The distinction between Sherwood Sandstone Group sand and glaciofluvial deposits in the model was made using lithological descriptions and stratigraphic interpretations in borehole logs. Sherwood Sandstone Group sand is only modelled where borehole logs describe the Sherwood Sandstone Group as sand. For example, borehole 163715, located in the south of the study area, was used to determine the presence of Sherwood Sandstone Group sand. which was used to determine the presence of Sherwood Sandstone Group sand. 0–0.7 MADE GROUND: brown silty topsoil with occasional medium to coarse subangular limestone gravel. 3.2 Stiff extremely closely fissured red brown sandy CLAY with occasional gravel and occasional lenses of sand. Gravel is fine subangular to subrounded and consists of sandstone, basalt and quartzite. Occasional shell fragments. (Glacial Till). 3.7 Dense red brown clayey fine to medium SAND with some pockets (<100 mm) of soft sandy clay. (Completely weathered Bunter Sandstone). [Modelled as Sherwood Sandstone Group sand]. 4.0+ Red brown medium grained poorly cemented slightly weathered SANDSTONE weak. (Bunter Sandstone). [Not modelled]. The model is constrained by 203 boreholes in the BGS Single Onshore Borehole Index, with lithological information entered into the BGS Borehole Geology database. When selecting boreholes for coding, priority was given to logs that intersect geological rockhead and those that record the most detail in the superficial deposits. The borehole location was also a consideration to ensure an even spatial distribution of borehole data as far as possible. A total of 23 boreholes located outside the model were coded to enable more accurate representation of the superficial geology towards the edges of the study area. These proved particularly useful where borehole data is sparse. Collectively, boreholes were used to construct 40 cross-sections using the geological map data and boreholes as the primary data sources (Figure 5). Figure 5 Distribution of the 203 boreholes (green dots) used to construct the 40 correlated cross-sections (blue) that constrain the model. Model area outlined in red. 1 km grid squares shown. The Thornton superficial geology model is capped by an extract from the national PNG Digital Surface Model, supplied by UKP/Get Mapping (2006). This has been processed to remove artefacts such as trees and therefore represents the actual ground surface. The maximum horizontal resolution is 5 m, sub-sampled to 10 m in the model to aid calculation. The elevation range of the ground surface in the study area is -3 to +44 m OD (Figure 6). Figure 6 3D view of the Digitial Terrain Model used to represent the ground surface and cap the Thornton superficial geology model. The main limitation of the model is the spatial distribution of available third party borehole data. Site investigation boreholes tend to be drilled in urban areas and along transport routes (e.g., the M56 motorway). 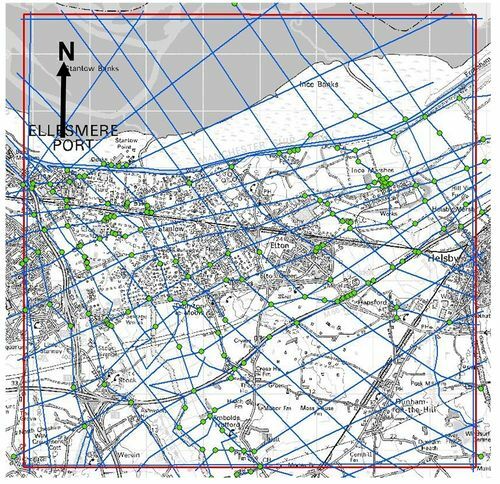 This leads to concentrations and gaps in the borehole data, which is particularly noticeable in this study in the Mersey estuary in the north of the model area and the south-east and south-west corners (Figure 5). Boreholes outside the study area were used to constrain the geology in these areas. The boreholes themselves can be a limitation of the model. Factors affecting the usefulness of borehole logs are the drilled depth, the amount of detail recorded in them and whether they have been logged to industry standards such as BS5930. The drilled depth is a limitation in some areas because not all of the boreholes used in the model reach rockhead. 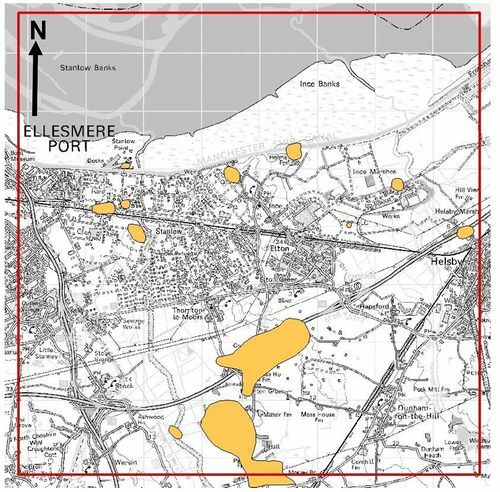 The only available boreholes that constrain the geology in the north of the model are located outside the study area in the Mersey estuary. These boreholes are useful for determining the presence and nature of the tidal flat deposits, but terminate within them and make their base difficult to constrain. Where clusters of boreholes occur only the deepest boreholes with the most geological detail were selected for use in the model. Of the 561 available boreholes in the study area 180 were selected for use in the model, plus a further 23 boreholes from outside the study area. The geological map data is also a limitation, particularly regarding the representation of artificial ground, which is not mapped. 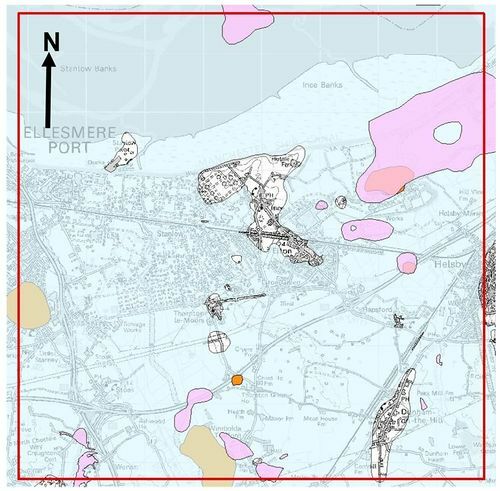 Changes made to the landscape through anthropogenic activity, such as quarries, embankments, cuttings and spoil heaps, are classed as artificial ground on BGS maps. These either post-date the mapping or were not recorded when the area was last surveyed. Made ground, where the ground surface has been artificially raised, is modelled where it forms features in the Digital Terrain Model, with the start heights of boreholes that pre-date them used to determine the original ground level. Worked ground is modelled where the Manchester Ship Canal, an excavated shipping route, crosses the model area (Figure 7). Figure 7 Cross-section Thornton_NS_12_CAIP, showing the modelling of artificial ground. The Manchester Ship Canal modelled as Worked Ground and Made Ground modelled where it forms an obvious feature in the DTM. Key as per Table 2. Figure 7 Cross-section Thornton_NS_12_CAIP, showing the modelling of artificial ground. The Manchester Ship Canal modelled as Worked Ground and Made Ground modelled where it forms an obvious feature in the DTM. Key as per Table 2. The model matches the corresponding 1:10 000 scale geological maps, with borehole logs used to validate the mapping of superficial deposits. Where mismatches occur between the mapped superficial deposits and the boreholes, precedence was given to the boreholes and the modelled distribution of the superficial deposits was matched to them. For example, a borehole used in cross- section Thornton_NS_2_HG records till at surface where glaciofluvial sand and gravel is mapped. The borehole evidence was given precedence over the geological map and till is modelled at this locality (Figure 8). Figure 8 Cross-section Thornton_NS_2_HG. The geological map shows glaciofluvial sand and gravel at surface but borehole log 163768 records till. Precedence is given to the borehole evidence and till is modelled. Key as per Table 2. A list of the 15 geological units modelled is provided in Table 2 in their relative stratigraphic order. Table 2 also serves as a legend for viewing figures of the geological model and cross-sections. Table 2 List of geological units modelled in relative stratigraphic order. MGR-ARTDP Made Ground: variable composition, modelled where obvious in the DTM and boreholes but likely to be more extensive in reality. Max modelled thickness 25 m.
WGR-VOID Worked ground: used to represent the Manchester Ship Canal, which runs across the northern part of the model. 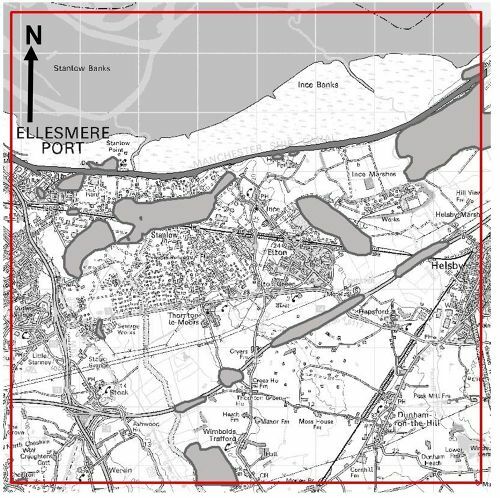 Outline digitised from 1:10 000 scale OS maps. Modelled to a depth of 8 m below water level in the cross-sections. PEAT-P Peat: fibrous and amorphous peat associated with the River Gowy. Max modelled thickness 7 m.
ALV-XCZSV Alluvium: clay and silt with peat primarily located in the River Gowy floodplain. Where possible the peat is modelled as a separate unit. Max modelled thickness 15 m.
TFD-XCZS Tidal Flat Deposits: clay, silt, sand and peat. Where possible the peat is modelled as a separate unit. Sand dominated in the north. Max modelled thickness 22 m.
PEAT-P_2 Peat: basal peat unit within the alluvium. Max thickness 3 m.
PEAT-P_lens Lens of peat within the tidal flat deposits/alluvium. Laterally persistent peat lens modelled where borehole logs allow, but may be more widespread in reality. BSA1-S Blown Sand: composed of silty sand. Max modelled thickness 4 m.
GFDUD-XSV Glaciofluvial Deposits (Devensian): gravel/sandy gravel with occasional boulders. Underlies the Tidal Flat Deposits and overlies the till. Max modelled thickness 13 m.
GLLDD-XCZ Glaciolacustrine Deposits (Devensian): isolated patches of stiff laminated clay overlying the till. Max modelled thickness 1.7 m.
TILLD-DMTN Till (Devensian): widespread gravelly clay with intervening sand and gravel/laminated clay modelled as lenses where possible. Max modelled thickness 45 m.
GLLDD-XCZ_lens Intra-till lens of stiff laminated clay. Modelled in isolated patches where borehole logs allow but may be more widespread in reality. GFDUD1-XSV_lens Intra-till glaciofluvial sand and gravel. Modelled in a small isolated patch where borehole logs allow but may be more widespread in reality. GFDUD1-XSV Basal glacial sand and gravel unit: modelled as patches where borehole logs allow but may be more widespread in reality. Contains intervals of till that are not modelled. Max modelled thickness 39 m.
SSG-SAND Sherwood Sandstone Group (SSG) sand: modelled only where boreholes describe the SSG as sand. Some uncertainty in areas where glacial sand and gravel directly overlies the SSG. Max modelled thickness 20 m.
Made ground — areas where the ground level has been artificially raised, such as road embankments and spoil heaps, are classed as made ground on BGS geological maps and models. With no artificial ground mapped in the study area, made ground is modelled where it forms features in the Digital Terrain Model. Made ground has a maximum thickness of 25 m in the model and a variable composition. Its distribution in the model is patchy and is likely to be much more extensive in reality (Figure 9). Worked ground — the Manchester Ship Canal, an excavated shipping route that crosses the north of the model area, is modelled as worked ground (Figure 9). Its extent was digitised from 1:10 000 scale Ordnance Survey topographic maps and imported into the 3D geological model. Figure 9 Modelled distribution of made ground (light grey) and worked ground (dark grey), model area outlined in red. 1 km grid squares shown. The Manchester Ship Canal is modelled to a depth of 8 m below the water level as represented in the Digital Terrain Model. This nominal 8 m depth broadly matches the average 8.5 m depth of the Manchester Ship Canal as recorded in a Manchester Evening News article (2016). The Manchester Ship Canal cuts through the natural superficial deposits and the underlying Sherwood Sandstone Group bedrock along some of its length, forming a potential ‘pathway’ into the aquifer (Figure 10). Figure 10 Cross-section ShipCanalH1_HBU runs west to east along the Manchester Ship Canal across the model, showing the superficial deposits underneath. Arrows indicate areas where the canal is directly underlain by Sherwood Sandstone Group. Vertical exaggeration x25. Key as per Table 2. Peat — mapped/modelled as PEAT-P at surface in the floodplain of the River Gowy, a tributary of the Mersey that reaches the coast at Stanlow Point. Boreholes reveal that the peat overlies alluvium in this area, as shown in Figure 11, where the peat is transparent to show the extent of alluvium underneath. 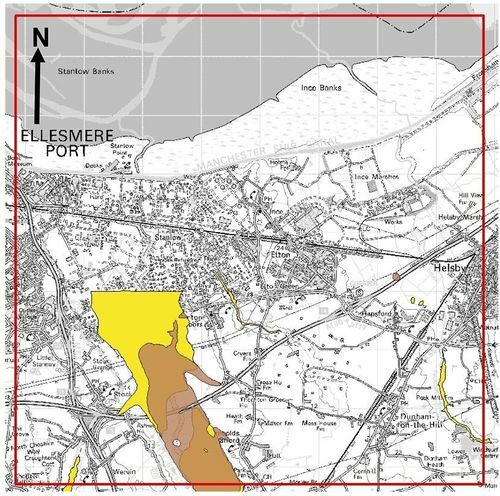 An additional small patch of peat was proved by the boreholes between Elton and Helsby. This surface peat unit has a maximum thickness of 7 m in the model. Alluvium — primarily mapped/modelled in the River Gowy floodplain as ALV-XCZSV, with an arbitrary mapped line separating it from the tidal flat deposits to the north, with which it is transitional. Several additional small tracts of alluvium are located in the southern half of the model area (Figure 11). Boreholes record the dominant composition of the alluvium as clay and silt. Its maximum thickness in the model is 15 m, at Thornton-le-Moors. Figure 11 Distribution of modelled peat (transparent, brown) and alluvium (yellow), model area outlined in red. 1 km grid squares shown. Tidal flat deposits — mapped/modelled as TFD-XCZS in the Mersey estuary and in low-lying coastal areas. An arbitrary mapped line separates them from the River Gowy alluvium, into which it grades. A lens of peat within the tidal flat deposits is modelled as PEAT-P_lens where indicated in the borehole logs (Figure 12). Two small patches of a thin basal peat unit (PEAT-P_2) are also modelled beneath the alluvium and tidal flat deposits (not shown in Figure 12). The dominant lithologies of the tidal flat deposits as described in borehole logs are clay and silt, becoming sand dominated into the Mersey estuary. The tidal flat deposits are modelled to a maximum thickness of 21 m.
Blown sand — forms a thin veneer in two patches in the Thornton Green area as BSA1-S (Figure 12). The blown sand is described in a borehole log as ‘yellow-brown and grey silty fine sand.’ It has a maximum modelled thickness of 4 m.
Figure 12 Distribution of modelled tidal flat deposits (transparent, blue-grey), a lens of peat in the tidal flat deposits/alluvium (brown) blown sand (cream). Model area outlined in red. 1 km grid squares shown. The main glacial deposit in the area is till, which covers most of the model area (Figure 13) and underlies the post glacial sediments. The till is overlain by patches of glacial sand and gravel and glaciolacustrine clay and contains lenses of these deposits. A basal sand and gravel unit is modelled beneath the till where borehole evidence allows. Figure 13 shows an extract from cross-section Thornton_NS_8_CAIP, which demonstrates the complexity in the glacial deposits and the variation in till thickness. 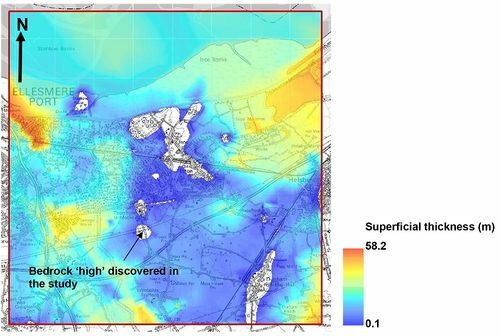 White space in the cross-section indicates bedrock, which is mapped at surface in the north. The glacial sediments are described in turn below. Figure 13 Cross-section Thornton_NS_8_CAIP showing the glacial sequence beneath the tidal flat deposits. Key as per Table 1. Vertical exaggeration x15. Till (TILLD-DMTN) — is the most widespread glacial deposit in the model area and consists of gravelly clay (Figure 14). The till reaches a thickness in the model of 45 m and includes lenses of glaciofluvial deposits and glaciolacustrine clay. The base of the till is undulating and breaks in the till cover occur where the Sherwood Sandstone Group bedrock reaches the ground surface. The modelled top and base till surfaces are shown with a blue to red colour ramp in Figures 15 and 16 respectively, with blue representing areas of lowest elevation. White areas in Figures 14 to 16 are where superficial deposits are absent. Glaciolacustrine clay — this is modelled in two small patches as GLLDD-XCZ, one at surface (Figure 14) and one beneath the glaciofluvial sand and gravel. Patches of an intra-till glaciolacustrine clay are modelled as GLLDD-XCZ_lens where borehole evidence allows. Glaciolacustrine clay is identified in borehole logs as stiff laminated silt and clay. Glaciofluvial sand and gravel — is mapped/modelled as GFDUD-XSV in patches at surface and overlies the till (Figure 14). Borehole logs describe a variable composition, from ‘dense silty sand’ to ‘gravelly sand’ through to ‘gravel with cobbles’. A large area of glaciofluvial sand and gravel is modelled beneath the tidal flat deposits in the north-east of the model area. 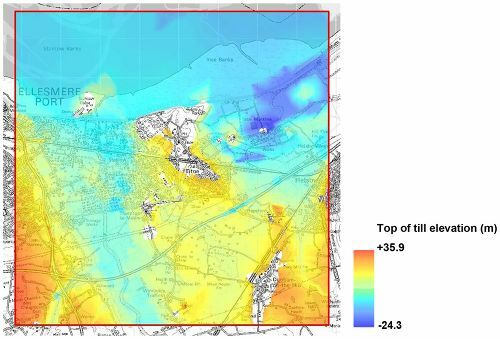 A lack of borehole data in this area prevents this unit being modelled further into the Mersey estuary. The maximum modelled thickness of the glaciofluvial sand and gravel is 13 m. A localised intra-till glaciofluvial sand and gravel is modelled as a lens where proven in the boreholes (GFDUD1-XSV_lens). Figure 14 Distribution of till (transparent, blue), overlain in places by glaciofluvial sand and gravel (transparent pink) and glaciolacustrine clay (orange). Lenses of glaciofluvial sand and gravel and glaciolacustrine clay within the till are also shown. Model area outlined in red. 1 km grid squares shown. Figure 15 Elevation grid showing the modelled top of the till, shown with a blue to red colour ramp. Areas of lowest elevation are coloured blue and red areas are of highest elevation. White areas indicate bedrock at surface. Figure 16 Elevation grid showing the modelled base of the till, shown with a blue to red colour ramp. Areas of lowest elevation are coloured blue and red areas are of highest elevation. White areas indicate bedrock at surface. A basal glaciofluvial sand and gravel unit (GFDUD1-XSV) is modelled beneath the till. This concealed geological unit is only modelled where recorded in boreholes, but may be more widespread than modelled (Figure 17). This unit has a maximum thickness of 39 m and contains localised intervals of till that are not modelled. Figure 17 Modelled distribution of concealed basal glaciofluvial sand and gravel unit GFDU1-XSV. Model area outlined in red. 1 km grid squares shown. The entire model area is underlain by Sherwood Sandstone Group bedrock. Named SSG-SAND in the model, this unit is only represented where boreholes record that the Sherwood Sandstone Group is weathered to sand (Figure 18). However, it is often difficult to distinguish between weathered Sherwood Sandstone Group and glacial sand and gravel. SSG-SAND has a maximum modelled thickness of 20 m.
Figure 18 Modelled distribution of Sherwood Sandstone Group where weathered to sand. 1 km grid squares shown. When the 3D modelling software calculates the model it produces a top and base surface for each geological unit and displays them as a block model (Figure 19). These unit bases can be combined and analysed to produce additional grids and surfaces, which are discussed in the following sections. Figure 19 3D view of the Thornton Science Park superficial model, looking from the south, with all geological units shown. Vertical exaggeration x20. Key as per Table 2. The combined bases of the Holocene sediments (peat, tidal flat deposits, alluvium and blown sand) and anthropogenic units (made ground and worked ground) were exported from the 3D geological model and subtracted from the Digital Terrain Model to ascertain their thickness (Figure 20). 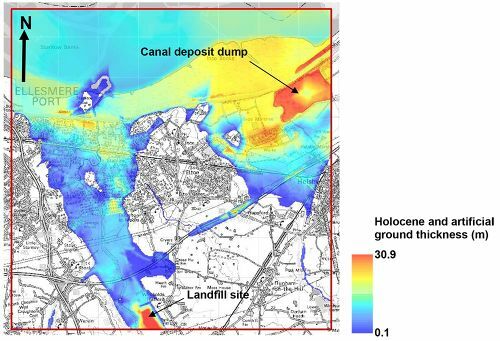 This gives a maximum thickness of 30.9 m. The canal deposit dump at Frodsham Marsh shows up clearly, where dredged material from the Manchester Ship Canal is tipped onto the ground surface. The thickest artificial ground occurs at a landfill site located in the south of the study area. Figure 20 Holocene and artificial ground thickness grid derived from the 3D geological model shown with a blue to red colour ramp. White areas indicate where these units are absent. Model area outlined in red. 1 km grid squares shown. A superficial deposits thickness grid was calculated by subtracting the combined bases of all modelled Quaternary and anthropogenic units from the Digital Terrain Model and clipping the resultant grid to the extent of modelled Quaternary and anthropogenic sediments. This gives a maximum combined thickness of 58 m for these units in the model area (Figure 21). The superficial thickness model matches the geology maps of the area and shows that superficial deposits are completely absent in some areas (shown as white patches in Figure 21). One relatively large area where superficial deposits are absent and Sherwood Sandstone Group bedrock occurs at the ground surface is around Elton in the middle of the study area. 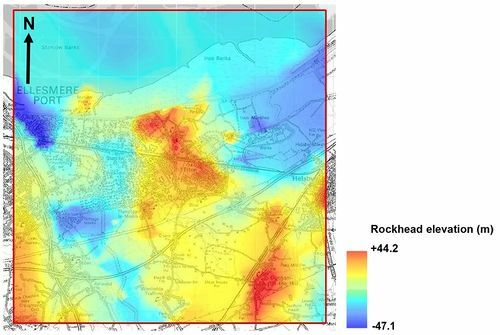 An unmapped ‘bedrock high’ just south of Thornton-le-Moors was discovered in the model using borehole evidence, and there may be others that are as yet unproven. 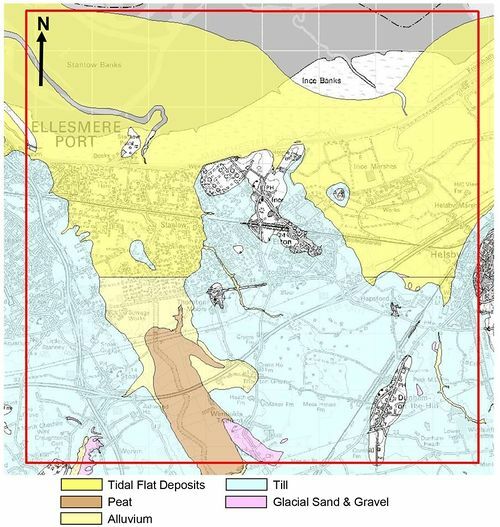 The superficial deposits are at their thickest around Ellesmere Port, where a thick accumulation of glaciaofluvial sand and gravel occurs beneath the till, as indicated by the red area in Figure 19. This is likely to be a buried channel feature. Figure 21 Superficial thickness grid of the model area shown with a blue to red colour ramp, with superficial deposits reaching up to 58 m in the model. White areas indicate bedrock at surface. Model area outlined in red. 1 km grid squares shown. 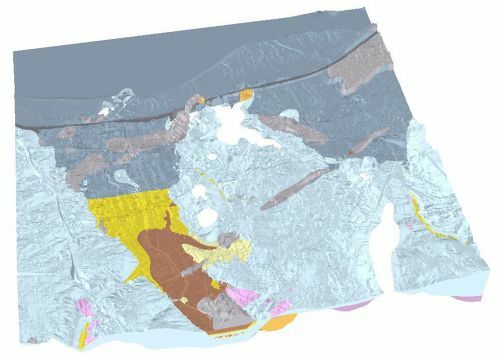 A geological rockhead elevation model was created by combining the bases of all Quaternary units in the model, which excludes Sherwood Sandstone Group sand. This gives an elevation range of +44 m to -47 m for the base of the Quaternary in the model. This rockhead elevation surface is shown with a blue to red colour ramp in Figure 22, with red indicating areas of high elevation and blue showing where rockhead is at its lowest elevation. 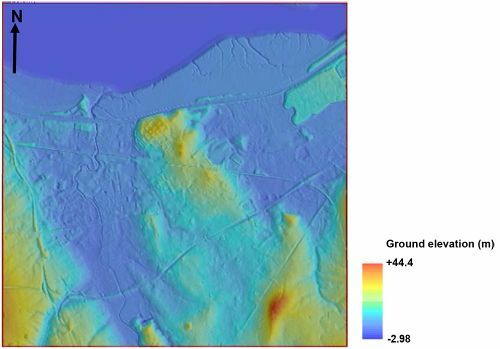 The Digital Terrain Model is used in areas where superficial deposits are absent and Sherwood Sandstone Group bedrock is present at the ground surface, such as at Dunham-on-the-Hill in the south-east corner. The modelled geological rockhead is at its lowest in the Ellesmere Port area, where a thick sand and gravel body underlies the till. Figure 22 Rockhead elevation model of the study area, derived from the combined bases of all Quaternary units modelled, shown with a blue to red colour ramp. The DTM is used where bedrock occurs at the ground surface. Figures 23 to 27 are key cross-sections from the geological model that convey the artificial and superficial geology of the area and indicate the presence of potential ‘pathways’ where permeable superficial deposits connect the ground surface with the underlying Sherwood Sandstone Group. These areas represent potential points of recharge to the bedrock aquifer. Cross-section Thornton_WE_1_CAIP runs SW–NE through the southern part of the model (Figure 23). Boreholes are represented as green dots in the inset map and vertical sticks in the cross-section according to their start heights (the elevation of the top of the borehole), which were honoured during cross-section correlation. Borehole start heights are useful for modelling artificial ground where the ground elevation has been raised since the borehole was drilled. However, there are some anomalous start heights, such as borehole 163251, which sits approximately 6m above the Digital Terrain Model. The dominant Quaternary unit in this cross-section is till, which is modelled with varying thickness, up to 33 m, throughout the section. An intra-till lens of glaciofluvial sand and gravel is modelled where recorded in boreholes. It is represented as a sand and gravel body completely enclosed by till, but it may actually be in contact with the Sherwood Sandstone Group bedrock laterally away from the cross-section, and may be more extensive. A laterally persistent lens of peat is modelled in the tidal flat deposits where proven in the boreholes. The cross-section is coloured down to rockhead, with white space representing Sherwood Sandstone Group bedrock. Sherwood Sandstone Group Sand is modelled beneath the till around several boreholes in the middle of the cross-section. Figure 23 Cross-section Thornton_WE_1_CAIP, which runs SW–NE through the south of the model area. This cross-section shows continuous till cover of varying thickness (blue) with intra-till sand and gravel (pink) and overlying tidal flat deposits (blue-grey). 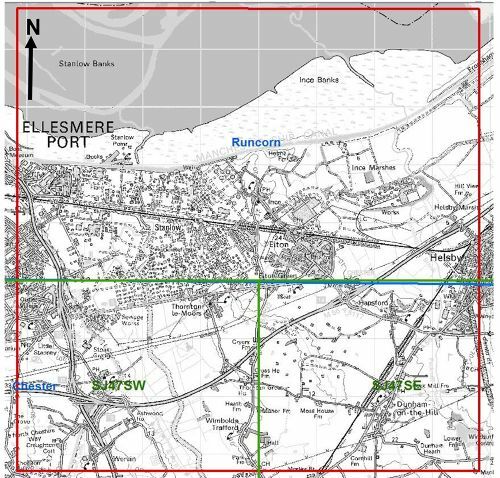 This section is highlighted in the inset map, with boreholes represented as green dots. Vertical exaggeration x25. Key as Table 2. Cross-section Thornton_WE_9_CAIP runs SW–NE through the middle of the model area (Figure 24). Tidal flat deposits are mapped/modelled in topographic low areas at intervals along this cross-section, with a peat lens modelled where proven in boreholes. This cross-section demonstrates the complexity in the glacial deposits, particularly in the north, where boreholes prove around 40 m of glacial deposits, comprising till, two intervals of glaciofluvial sand and gravel, and an intervening interval of glaciolacustrine clay. However, there is some uncertainty in discerning between weathered Sherwood Sandstone Group bedrock and basal glaciofluvial sand and gravel in the boreholes in this area. For consistency, Sherwood Sandstone Group sand is only modelled where it is recorded in borehole logs. Similarly, glaciofluvial sand and gravel and glaciolacustrine clay are only modelled only where described in boreholes and may extend further than shown. For example, the two bodies of glaciofluvial sand and gravel directly beneath the tidal flat deposits in the northern end of this section may actually be contiguous. Sherwood Sandstone Group bedrock is mapped/modelled at the ground surface in the middle of the cross-section, forming a bedrock ‘high’ with the till pinching out either side. Figure 24 Cross-section Thornton_WE_9_CAIP, which runs SW–NE through the middle of the model area. This cross-section shows the complexity in the superficial deposits, with a thick sequence of glaciolacustrine clay (orange), till (blue) and glaciofluvial sand and gravel (pink) recorded beneath the tidal flat deposits (blue-grey) in boreholes in the north of this cross-section. This section is highlighted in the inset map, with boreholes represented as green dots. Vertical exaggeration x25. Key as Table 2. Cross-section Thornton_WE_2_HG runs SW–NE in the northern part of the model (Figure 25). 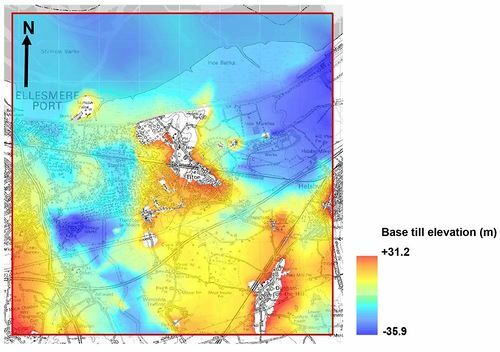 This cross-section shows the lack of borehole data in the Mersey estuary, which presents a challenge for determining the base of the tidal flat deposits and glacial sediments in the area. In the absence of borehole data a similar thickness for the tidal flat deposits was assumed using the proven base in boreholes in the western end of the cross-section and the underlying till is assumed to extend uninterrupted into the estuary. Till is not recorded beneath the tidal flat deposits in several boreholes located to the east of the Manchester Ship Canal and is therefore not modelled in the area, with tidal flat deposits directly overlying the Sherwood Sandstone Group bedrock. Glaciofluvial sand and gravel is proven in a borehole used in a crossing section to a depth exceeding 45 m and is also correlated in this cross-section, forming a localised channel-like feature in the western part of this cross-section. This cross-section runs across the Manchester Ship Canal, which is represented as worked ground to a depth of 8m below the water height, which forms a trough in the Digital Terrain Model. Thick accumulations of made ground are modelled either side of the Manchester Ship Canal, constrained by the base of made ground recorded in boreholes and the Digital Terrain Model. Several of these boreholes have start heights several metres below the Digital Terrain Model and therefore pre-date the raising of the ground surface in the area. Figure 25 Cross-section Thornton_WE2_HG, which runs SW–NE through the north of the model area. 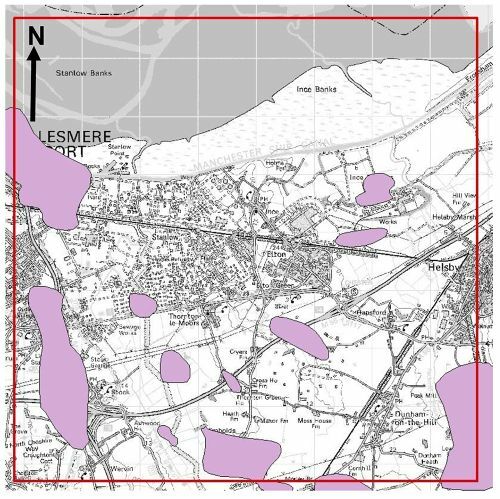 This section shows the lack of borehole data in the Mersey estuary, a localised thick deposit of glaciofluvial sand and gravel (pink) and artificial ground around the Manchester Ship Canal. This section is highlighted in the inset map, with boreholes represented as green dots. Vertical exaggeration x25. Key as Table 2. Cross-section Thornton_NS_2_HG runs NW–SE in the west of the model (Figure 26). This cross-section shows the extent of alluvium beneath peat in the floodplain of the River Gowy and the mapped/modelled arbitrary contact between alluvium and tidal flat deposits. The peat lens in the tidal flat deposits is less extensive in this cross-section, being confined around two boreholes. The dominant glacial unit is till, which is modelled throughout the cross-section. A thick interval of glaciofluvial sand and gravel is recorded in a single borehole in the south of the section. Again, this is modelled as a localised lens completely surrounded by till, but may actually be more laterally extensive than shown. A thick basal glaciofluvial sand and gravel unit is modelled at the northern end of this cross-section, where a borehole records over 30 m of ‘silty clayey sand’, ‘sand and gravel’ and silty sand’ with minor amounts of thin ‘stiff brown clay’ and ‘boulder clay’ beneath the till. This is constrained by a borehole to the east that records sandstone. Sherwood Sandstone Group sand is modelled in the south of the section where boreholes describe the Sherwood Sandstone Group as weathered to sand. Figure 26 Cross-section Thornton_NS_2_HG, which runs NW–SE through the west of the model area. This shows the extent of alluvium (yellow) beneath peat (brown) and thick glaciofluvial sand and gravel (pink) in the north. This section is highlighted in the inset map, with boreholes represented as green dots. Vertical exaggeration x25. Key as Table 2. Cross-section Thornton_NS_8_CAIP runs NW–SE through the east of the model area (Figure 27). This cross-section shows a thick body of made ground, modelled where it forms a feature of high ground in the Digital Terrain Model. The borehole start heights are used to define the base of the made ground, which is assumed to post date the borehole logs. Extensive tidal flat deposits are modelled in this cross-section, with the Manchester Ship Canal cutting through them. There are no boreholes to constrain the base of the tidal flat deposits in the north of this cross-section where it runs into the Mersey estuary. A similar thickness is assumed to that recorded in boreholes in the middle of the section, with till modelled underneath. A bedrock ‘high’ is modelled where Sherwood Sandstone Group bedrock is mapped at the ground surface. Again, this cross-section shows complexity within the glacial sequence, with localised glaciofluvial sand and gravel deposits modelled around borehole logs. The distribution of these sand and gravel units is poorly constrained and may actually extend further than shown. Figure 27 Cross-section Thornton_NS_8_CAIP, showing a bedrock ‘high’ where Sherwood Sandstone Group is mapped at surface. This section shows complexity in the glacial sequence, with glaciofluvial sand and gravel above and below the till proven in boreholes. This section is highlighted in the inset map, with boreholes represented as green dots. Vertical exaggeration x25. Key as Table 2. ↑ KESSLER, H, MATHERS, S J, and SOBISCH, H-G 2009. The capture and dissemination of integrated 3D geospatial knowledge at the British Geological Survey using GSI3D software and methodology. Computers and Geoscience 36 (6), pp.1311–1321. ↑ BURKE, H F, CRIPPS, C, GOW, H V, and HUGHES, L. 2016. 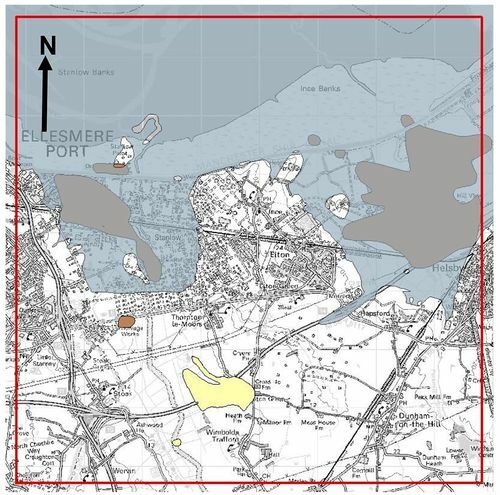 Metadata report for the Thornton Science Park superficial geology model. BGS open report no. OR/16/051 (unpublished).